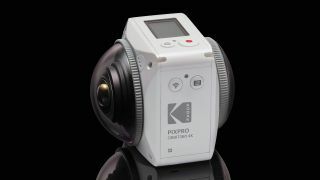 Kodak has rolled out a new PixPro Orbit360 4K action camera to help make creating 360-degree movies a simpler process. Whereas the older Pixpro SP360 4K, required you to buy and pair two separate cameras to record 360-degree videos, the PixPro Orbit360 4K combines two sets of cameras and lenses into a single block like the Nikon KeyMission 360. For 2017, the Pixpro Orbit360 4K also ups the resolution from 12MP to 20MP while retaining the same wide-angle lenses that capture a 235-degree field of view. The camera’s two sensors allow users to shoot 3,840 x 1,920 footage at 24p. The Orbit360 4K can also capture slow motion action at 1,440 x 720 and 120fps. Alternatively, users can also choose to record with only one camera for 3,840 x 2,160 resolution 30fps video. Just like its predecessors, the Pixpro Orbit360 4K comes equipped with NFC and Wi-Fi to effortlessly pair with your smartphone. As an action camera, it’s also been ruggedized to withstand two-meter drops, 14-degree Fahrenheit (-10 degree Celsius) temperatures and waterproof enough to withstand a waterjet. Kodak will launch the Pixpro Orbit360 4K at a $499 (about £410, AU$695) price.